Elect Casey, a Norman Rockwell painting , appeared on the cover of The Saturday Evening Post published November 8, 1958. This is another timeless favorite of Rockwell collectors, a classic for all the ages. This painting was Rockwell's 303rd overall out of 322 total paintings that were published on the cover of the Saturday Evening Post. Rockwell's career with the Post, spanning 47 years, began with his first cover illustration, Boy With Baby Carriage in 1916 and continued through his last, Portrait of John F. Kennedy, in 1963. This was also the fifth cover for The Post in 1958. In 1958, there were five Norman Rockwell Saturday Evening Post covers published. The original oil on canvas painting, 52 x 42 inches or 132 x 106.5 cm, is part of the collection of Curtis Publishing. on page 221 of Norman Rockwell, A Definitive Catalogue by Laurie Norton Moffatt. Two studies is also reproduced on page 221 and 222 of the Norman Rockwell Catalogue. 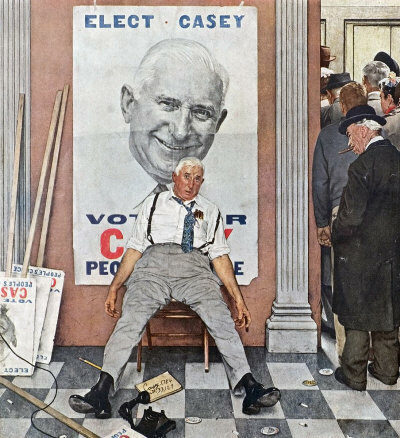 Norman Rockwell perfectly captures election night disappointment in this painting. Well, this election is over. The candidate, the "People's Choice" as it is proclaimed on his campaign posters, has lost. He has lost by more than a landslide. No one could accurately predict the outcome of an election, but ta defeat of this magnitude seems to have overcome Mr. Casey. Notice the contrast between the two portraits of Casey. What a difference a couple of hours makes. No doubt, Mr Casey will be back to his old self after the shock of the election wears off. Bernard T. Casey portrayed himself in this painting. Casey was an eight term State Legislator from Boston, Massachusetts. He never lost an election and certainly never by this margin. When he retired from piublic office, he continued full time as a telephone company executive.. Elect Casey was only one of 322 Norman Rockwell Saturday Evening Post covers; Here is the list of Norman Rockwell Saturday Evening Post cover illustrations. The fellow smoking a cigar seems to be telling the candidate to get up and get over his disappointment. This character was modeled by Tom Carey, a Stockbridge, Massachusetts local. Carey carried mail and was a seasonal tourist guide. Do You Have A Great Story, Opinion Or Contribution About Elect Casey?